The one room that’s supposed to hold all the clutter is too full to keep the door closed. 2) Mac and Cheese for dinner. My friends secretly feed it to their kids even though they post a deliciously healthy meals on Facebook. I didn’t feel like wearing my Spanx today. 4) TV as a babysitter. An hour of quiet time does a world of good for my attitude! 5) Telling you to stop making me laugh. No seriously, stop making me laugh, I’m peeing myself! Women who aren’t moms secretly wish they were moms so they would have an excuse to wear them all day. 7) Forgetting our lunch date. A glass of wine + lack of sleep = I don’t remember anything I did or planned past 7:00 pm last night. 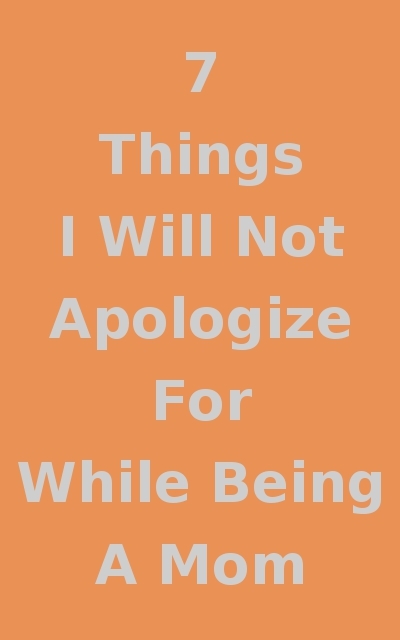 What won’t you apologize for?